The purpose of this article is to demonstrate how you can implement a scenario in which the end-users are able not only to choose from a predefined list of values represented by RadDropDownListEditor, but to add their own values to that list. In order to achieve this goal, you need to add the value typed by the end-user to the datasource of the GridViewComboBoxColumn. This will allow the end-user to use the typed value in his/her further operations with the RadComboBoxEditor of the GridViewComboBoxColumn. For the purposes for the example, we will build our custom RadComboBoxEditor in the context of a sample scenario where RadGridView is bound to the Products table of the popular Northwind database and where we have a GridViewComboBoxColumn bound to the Categories table of the same database. The name of the form on which the RadGridView instance lies is AllowEndUsersAddItemsComboBoxEditor. The appropriate instances of the DataSet, BindingSources and TableAdapters are created. RadGridView is bound to the binding source of the Products table. The AutoIncrementStep of the CategoryID field in the Category table is set to 1. 3. Now it is time to create our custom editor. For the purposes of our goal, we need to create a class that derives from RadDropDownListEditor and override the EndEdit method. // Checking if the typed value exists in the datasource of the column.
' 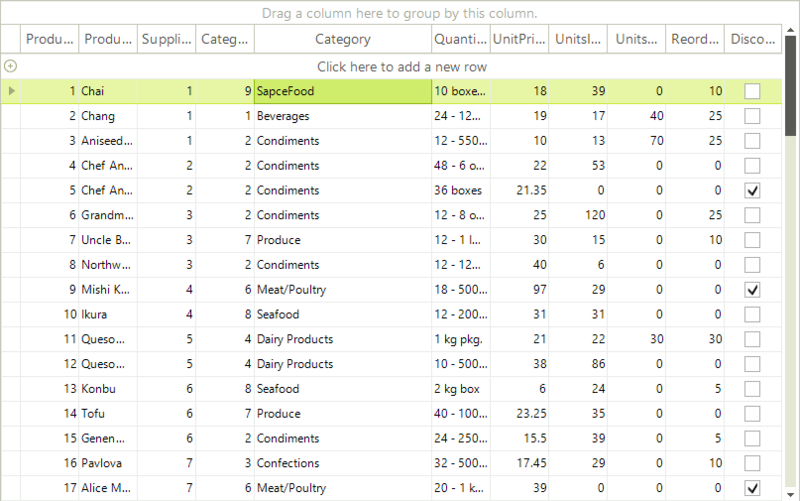 Checking if the typed value exists in the datasource of the column. // An example of what we can do when we enter the custom text. // the ID value of the newly created row to RadGridView. // you find suitable for this purpose, for example, on FormClosing.
' An example of what we can do when we enter the custom text.
' the ID value of the newly created row to RadGridView.
' you find suitable for this purpose, for example, on FormClosing. 6. The Tag value saved in the previous code snippet is used in the CellEndEdit event handler of RadGridView. It helps us to set the ID of the newly created record to the cell that the end-user has just edited. As a consequence, the correct string value is displayed in the cell of RadGridView. Change the Active Editor Depending on the Cell Value Type.